This is a generalization of a one hundred years old problem. If from any point in a diagonal of a parallelogram lines are be drawn to the opposite angles the parallelogram will be divided into two pairs of equivalent triangles. The problem appeared in a periodical publication Mathematical Visitor and then included into a recent collection under the same name. It took the broadcast power of internet for the problem to reach overseas and a generalization emerge. Floor van Lamoen, The Netherlands, has noticed that point M does not have to lie on a diagonal of the parallelogram for there to be two pairs of triangles with equal sum of areas. It follows that the remaining area, Area(BMC) + Area(AMD) is also Area(ABCD)/2. So that the two are equal. The two lines through point M parallel to the sides of the parallelogram cut the latter into four smaller parallelograms. 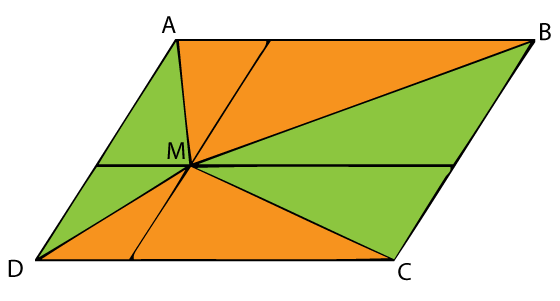 Each of these is divided by the diagonal from M into two (green and orange) equal areas.